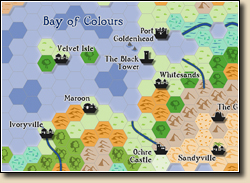 The Overland Hex drawing style is now available as a free download. Check it out as an example of what the Annual has to offer. Download the Style Pack: Overland Hex (3 MB) now! Note: This is the version for CC3 (v3.43). The CC3+ (3.76) version is part of the free Annual sampler available here. 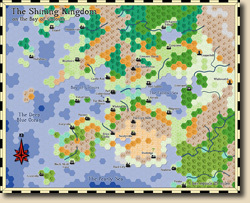 The July issue of the Annual 2010 brings you the winner of the user suggestion vote we ran in March: an Overland Hex mapping style reminiscent of old rpg publications. Forum user Jaerdaph suggested it, and it was the community's clear favorite. The style is very easy to use and still creates maps in a unique and beautiful look. The accompanying mapping guide will not only teach you how to use this style but also hex symbols in general.